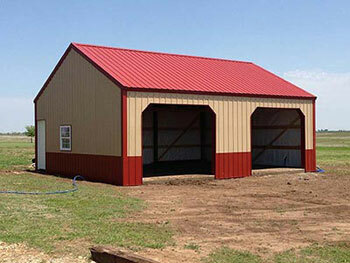 For more than twenty years we have been providing top-notch pole barn Tulsa construction services for Oklahoma farmers. D Cross Barn Co. specializes in post frame and pole barns Tulsa buildings which are ideal for any farm. Your farm may need single pole barns for equipment storage or several buildings for different reasons; store products and equipment, house your livestock, use as a work shop, or whatever you decide. We’re here and ready to provide our superior construction services at affordable prices. This is one of the most popular pole barns Tulsa buildings situated on the majority of farms; an insulated workshop. D Cross can provide an insulated workshop for you to use year-round as you see fit because we know farming is a round-the-clock every year kind of job. Our professionals will properly build your workshop with insulation to protect you from the hot or cold weather and to encourage a geothermal effect. Because insulated workshops can range in size, we also offer the option of an acoustic metal ceiling, so the sound of rain and other weather elements outside, isn’t maximized on the inside. If you want an energy-efficient insulated workshop for your farm, give D Cross’s experts a call today. Farms require a lot of equipment, tools and other necessary items, to be a success. However, this means that you will likely require a great deal of space for storing equipment. If this resembles what you need, consider our pole barns Tulsa machine shed construction service. Your large equipment needs to be stored properly and our machine sheds offer that; security, moisture-resistance, weather-proof, maintenance-free. No matter the size you may need our professionals use particular methods that enable us to build the perfect size shed without sacrificing any durability. It will be large enough for your needs and sturdy so that your equipment stays protected year-round. A cold-storage shed is a great way to store your perishables and allows sufficient room to utilize the space as you wish. This pole barns Tulsa building will hold a steady temperature (a crucial factor) and have the ability to combat many adverse conditions. In addition it provides one valuable factor to any farmer; it’s low-maintenance. With a cold-storage shed you can let go of worrying about your perishables and know that they will be safe and secure. If you need a shed for your cattle then consider allowing D Cross to help you make it happen. We work with our clients to design the ideal building for their needs because not every cattle operation is the same, therefore the building requirements aren’t either. In addition, we provide many different features so your cattle shed will be exactly how you want it. If you have horses then you need a secure, sturdy place to house them. Our professionals at D Cross Barn Co. have been building unique pole barns Tulsa stall barns for Oklahoma farmers for over twenty years. It’s for this reason we understand the importance of your horses and your need to keep them safe and secure. We are proud to offer an array of custom features for your barn so you get exactly what you want. Whatever kind of barn or building you may need for your farm, our professionals have the working experience and quality products and equipment to make it happen. Our pole barns Tulsa buildings are the best in the area. Improve your farm’s efficiency with D Cross Barn Co.’s quality construction services; call today to learn more about our offered farm building construction services.